As all of these processes involve handling sharp blades (and dull blades which can actually be more dangerous), exercise some caution. No pointing the blade at your self, wear your safety goggles, and absolutely no running with the scissors. For this method, use medium grit sandpaper. Cut the scissors into sandpaper a few times, turn the scissors over, and cut a few more times. Check the sharpness. If the blade isn't as slick as you'd like, repeat the process. As you can imagine, the entire length of each blade needs to rub across the sandpaper to sharpen them completely. Like with sandpaper, sharpening with aluminum foil involves cutting into the foil repeatedly to remove burs and nicks from the blades. The aluminum foil needs to be folded over a few times and flattened before cutting. Alternatively, you can use steel wool with the same method. You can use the shaft of a screwdriver to burnish the cutting edge. 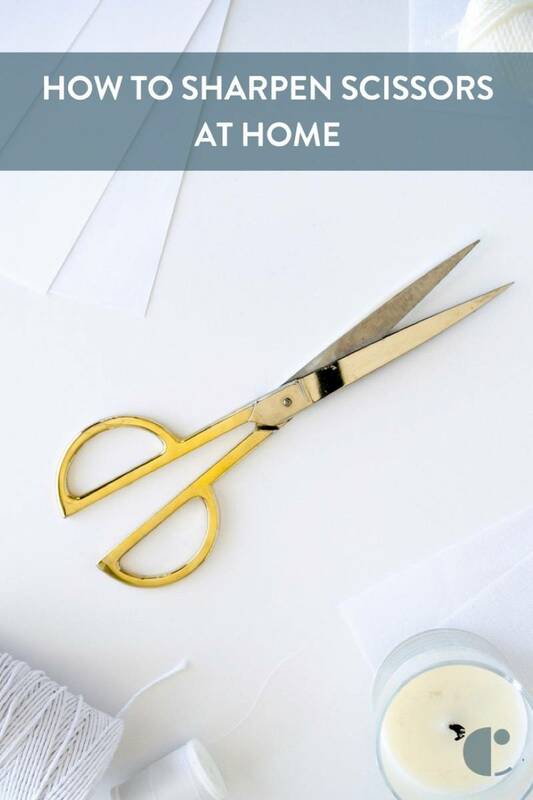 Open the scissors wide and close down like you're cutting, then move the scissors from the top to the tip on the metal shaft. Do this for both blades. Alternatively, you can use a mason jar or other glass container that you don't mind damaging. Open the scissors around the glass, and "cut" at the side of the jar repeatedly, running the length of both blades against the glass. Yep, you can buy sharpeners! Not only are they pretty safe, but they're also super easy to use. You can use either a knife sharpener, or a specially-designed sharpener just for scissors. Both sharpeners have their pros and cons. Knife sharpeners are nice to have in the home for the sheer fact that they can sharpen a wide variety of blades. Scissor sharpeners are safer to use as the blade is contained, plus they can sharpen both blades at once. You can pick up a sharpening stone at your local hardware store. They come in a variety of sizes as needed for different blade lengths, and run between $5-15 depending on the size. The stone comes with one coarse side and one fine side. A new stone has to be soaked in machine oil overnight. It also should be kept in a closed container between uses, and lightly oiled before each use. Step 1: Hold the sharp edge of one blade flat against the stone. Step 2: Keep the blade as flat to the stone as possible, and hold the scissors at an angle. Slide the blade away from yourself while moving the blade from the tip to the end (i.e., when the blade is closest to you on the stone, you will be sharpening the tip; when the blade is farthest from you on the stone, you're sharpening near where the screw sits). Do this a few times until the blade is sharp. Step 3: Repeat steps 1-2 on the second blade. Sharpen By Mail - starting at $5 for household scissors, going up to $25 for professional blades. As you can see, all of these scissor sharpening services are useful if you don't have a place near you that can do it. You'll have to pay shipping on top of the service fee though. Just want to know "is there scissor sharpening near me?" - here's a handy Google Maps link. Share these tips on Pinterest! To keep your scissors preserved and have the sharpness last longer, it's best to have different pairs for different tasks. For example, I have one pair that only cuts fabric, and one pair for everything else I need to cut in my life. 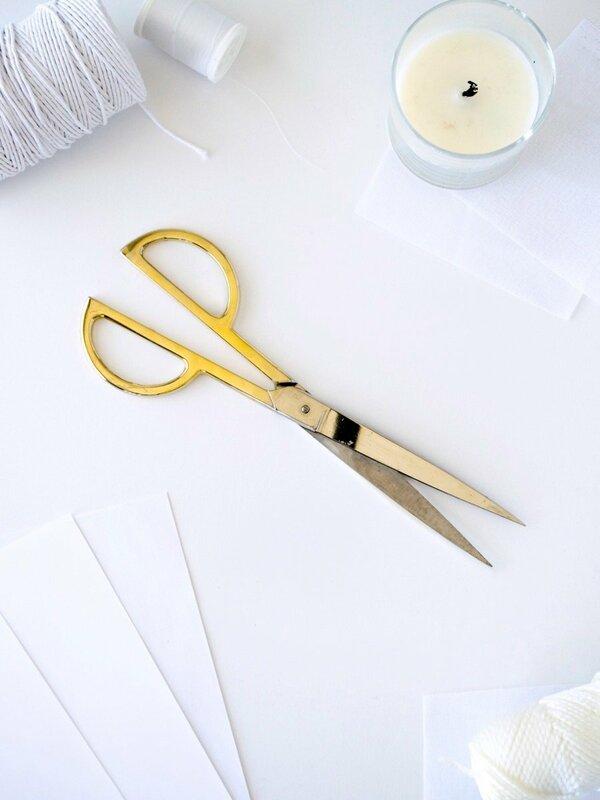 Hopefully these tips will help you get your scissors in tip-top shape once again. @Charlene I don't see why not! If you still need help deciphering the sharpening instructions, I recommend going to your local woodworkers' supply and looking into sharpening info. My husband's knowledge of sharpening is mostly limited to plane blades and chisels (gleaned from Mr. Lee's - yes, that Lee - excellent book). However, when he looked at your instructions, he instantly understood how it was done and could show me. I believe the book also has a reasonable amount of discussion on oil stones vs water stones, and which to use and sourcing each of them. I would like to congratulate you, as I am a sharpener by trade. you described the process perfectly, except that when your blade is sharp you can hear it, because it makes that beautiful ssnnniiick sound. J. Patrick Madden, co-founder of M & M Sharpening Services. I would recommend water instead of oil on the stone. Once you use one or the other you have to continue using it exclusively; it is far easier to have water on hand than the right kind of oil.